Ready to change your weight loss fate for good? 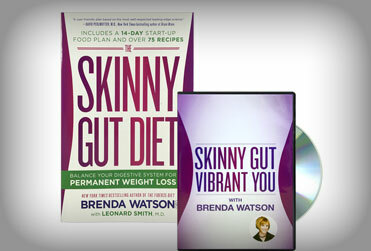 The Skinny Gut Diet reveals the missing piece of the puzzle’sthe secret to losing weight and keeping it off that Brenda calls the gut factor. Peek inside the book today and discover how living a Skinny Gut lifestyle can help you absorb fewer calories from food, curb cravings and store less fat’sall with the benefits of improved digestion, a stronger immune system and even a better mood. The Skinny Gut Diet explores the little-known link between a healthy gut and permanent weight loss—and it has everything to do with the 100 trillion bacteria in your digestive tract. Studies show that a balanced digestive tract (meaning the right amount of good bacteria vs. harmful bacteria) stimulates weight loss by enabling your body to absorb fewer calories from food, experience fewer cravings, and store less fat. The premise is simple: curtail sugar consumption (and learn to spot its surprising sources) and eat more healthy fats, living foods, and protein to balance the bacteria in your digestive tract. The result? Lasting weight loss—plus the side benefits of better digestion, a stronger immune system, and even a better mood! With The Skinny Gut Diet you will be introduced to an easy-to-follow eating plan that will help you achieve and maintain digestive balance and lasting weight loss. It includes a 14-day eating guide and more than 75 delicious and easy-to-prepare recipes to help you get started, along with inspiring real-life stories of Skinny Gut dieters who transformed their health and their waistlines.